Jeff Galloway, former Olympian and one of America's foremost Marathon trainers, has joined runDisney as the Official Training Consultant. The Disney Endurance Series has now been renamed runDisney and has a website at http://www.rundisney.com/. In his role as Official Training Consultant, Jeff Galloway is providing free training videos and marathon training plans for those who would like to be able to train for the Disney Marathon. 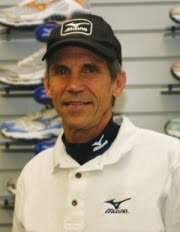 Jeff promotes his very successful Run-Walk-Run training method that has helped over 200,000 runners be successful in training to meet their running goals. He stresses this approach to help people achieve their goal of running a marathon and doing so injury free. Disney has done a great job of offfering a variety of endurance running events and bringing Jeff Galloway on board shows their committment to continuing to offer these great events. Next up on the Disney World running calendar is the inaugural Wine & Dine Half Marathon which takes place on October 2nd. That is followed by the Disney Marathon Weekend on January 7-9, 2011. If you are a runner, then visit the runDisney website to get inforamtion about these great running events and now be able to get training advice as well. 0 comments to "Jeff Galloway Is runDisney Training Consultant"